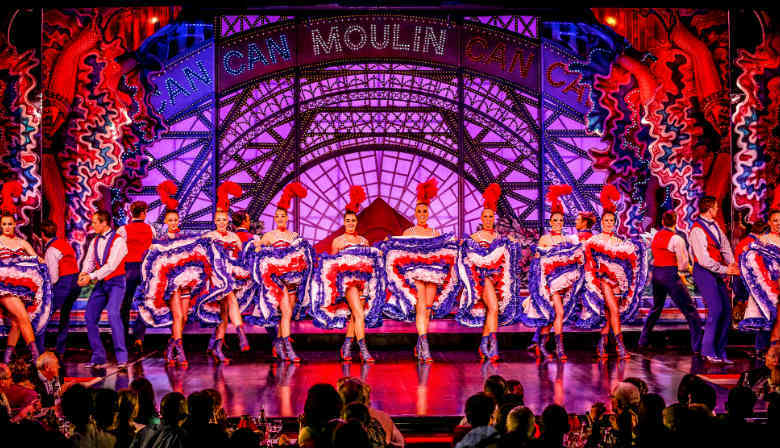 Spend a memorable evening in Paris with a dinner-cruise through the heart of the City of Light and a unique cabaret show at the Moulin Rouge. Pick-up from your Paris accommodation at 5.30 pm by minibus (maximum of eight people) for a Seine river dinner cruise on board the La Marina floating restaurant. Enjoy a truly captivating experience with a delicious gourmet meal as you watch Paris's famous illuminated monuments and bridges speed by: the Orsay Museum, Notre Dame Cathedral, the Conciergerie, the Eiffel Tower, and the Louvre Museum, etc. What a backdrop! After your cruise, watch the unique cabaret review show at the Moulin Rouge in Montmartre. The Moulin Rouge is known all over the world for its famous French cancan and has been performing its legendary review shows for 120 years. The current review, entitled "Fairy", includes performances from 100 artists, including 60 beautiful Doriss Girls. Be amazed by this world of rhinestones, feathers and sequins! After the show, your driver-guide will take you back to your Paris accommodation by minibus. I called La Marina to ask for a window seat, they specified to guarantee a window seat I would have to pay 20 euro extra which I did. Then on the boat it was clear that there were ONLY window seats, so why did they charge me? Also I informed them it was my husbands birthday and they neglected to do anything. They then celebrated a neighboring table's birthday and not ours. After the cruise our chaperone Jorge left us waiting on the street in freezing weather for over 30min while he completed another tour. I also told him the Moulin Rouge part was a surprise for my husband and he then ruined the surprise by telling him where we were driving! This tour was fantastic as was the driver. I would highly recommend this tour if you want to go and see Moulin Rouge. The dinner and show along with the convenience of being picked up from our hotel and dropped back to the hotel was well worth the money. Great attention to customer service!